OEM Manufacturer of a wide range of products which include fire alarm system and cctv system. To forewarn the likely start of fire or the possbility of fire damaging materials and property, it is essential to install a fire alarm system. Basicaly, this consists of a number of fire detectors suitably selected and connected to a fire alarm unit. It can be disigned to inform the authorities for necessary action. Details of various areas to be covered, nature of materials and types of usage of areas are required to design a suitable fire alarm system. The sensors and the electronic equipments are of proven brands to ensure proper performance of the system. * App. Price of detector is indicated here. * Detailed offer will be sent based on site conditions. Basicaly, this consists of a number of cameras located at various places and connected to a CCTV Monitor unit. 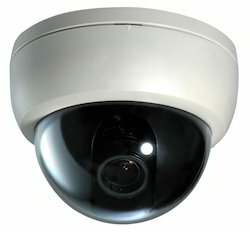 Details of areas to be covered is required to design a suitable CCTV system. * App. Price of camera is indicated here.